With over 2000 acres of pristine wilderness and countless scenic vistas there is ample room for your private party, group event, charity event, wedding or corporate gathering. Looking for the perfect place for your event? Note: The Wilderness Rider Buffalo Ranch and OHV Park offers countless opportunities to experience the Ozarks. There is room for multiple events on the same day. Please call 530-377-6678 or email tttproductions@aol.com. Where do all the “Big Kids” go for Easter? 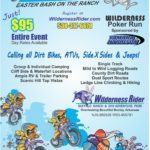 Come join us in the Ozark Mountains in beautiful Northwest Arkansas and celebrate the Easter weekend with your off road friends. One of a kind primitive camping sites on property including cliff side and waterfall locations. RVs are welcome! No hook ups. Poker Run entry fee included in event registration. We are avid outdoor and riding enthusiasts wanting to perpetuate great dirt riding, camping, off roading, hiking and climbing opportunities in the upper Buffalo River Headwaters Region of the Ozarks.